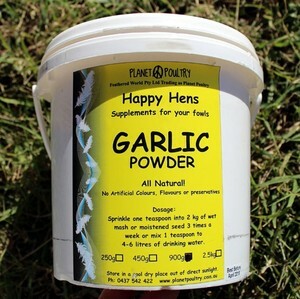 The herb Garlic has been universally used as a medicine and tonic food for thousands of years. Garlic stimulates the immune system, is an anti-bacterial, anti-viral, anti-fungal and anti-parasite, and is rich in sulphur and trace minerals such as zinc and copper and also contains bioflavoniod compounds. 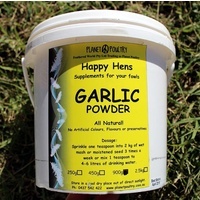 Garlic may assist in the control of internal and external parasites and respiratory complaints. Garlic is a natural antibiotic which is known to be effective in fighting bacteria, especially within the digestive tract. Poultry Dosage: Sprinkle one teaspoon into 2kg of wet mash or moistened seed 3 times a week. Packed in white plastic bucket.